I don’t think I’ve ever met a brownie I didn’t like. But what I don’t like is all the calories, fat and sugar! So I love to find ways to cut those down, without sacrificing taste. And I have totally succeeded with this recipe! 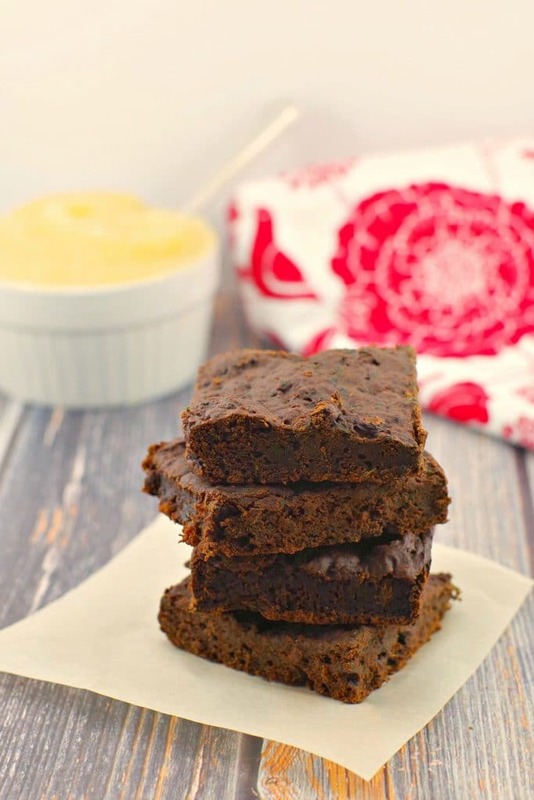 I was blown away by how delicious these Healthy Applesauce & Spinach Brownies are, at only 4 Weight Watchers freestyle smart points per brownie! And they are fairly substantial sized brownies too. Being on Weight Watchers does not mean giving up chocolate. Anyway, I really don’t think I could follow a weight loss program that didn’t allow me to eat chocolate. That’s simply unrealistic, not to mention cruel. 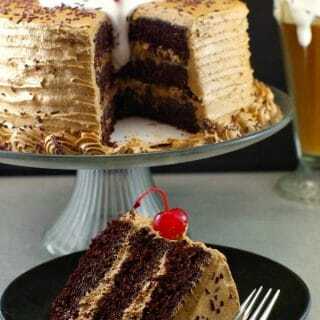 I have always struggled to find tasty, healthy and weight watchers friendly chocolate desserts. And I had a really tough time finding an easy brownie recipe that meets all those requirements, that is, until I created this one! These brownies are so good, you won’t even believe they are low-fat and healthy too. I’m also huge fan of veggies in my dessert. It just makes me feel like I’m eating something healthier and actually getting some vitamins with my chocolate. And therefore I feel less guilty. I tried spinach brownies years ago and was pleasantly surprised. 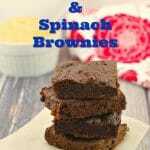 My kids also love these brownies too, even after they found out there was spinach in them. But when they were smaller, I would hide veggies in my brownies. Although there are those that believe you shouldn’t trick your kids into eating vegetables by ‘hiding’ them in food, I am all for hiding veggies in food! “Whatever it takes”, is my motto. I’ve heard the argument that you need to teach kids to get used to eating veggies, straight up, right from the start. 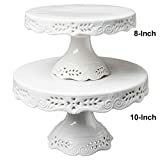 And although I always tried to get them to eat veggies in their original state, a little bit of extra healthy stuff hidden in dessert never hurt anyone! Plus, slipping extra veggies into my baking or sauces and soups (where it was appropriate) is something I’ve always done, long before I even had kids. I see it as a bonus. I believe vegetables definitely have a place in desserts! This delicious Healthy Tropical Green Chocolate Chip Cookies Recipe is also made with spinach and another example of a delicious sweet with made with veggies. It’s so tasty won the Old Farmer’s Almanac Spinach contest in 2017. Jessica Seinfeld’s book, “Deceptively Delicious” came out when my kids were little. She included a lot of really great recipes with vegetable purees, including a spinach brownie recipe. But she advocated that you have a routine and devote a great deal of time each week to steaming, pureeing and freezing vegetables. I don’t have that kind of time on my hands, so I make them as needed. In this recipe I used the microwave to quickly steam the spinach, then pureed it. This Healthy Applesauce & Spinach Brownie recipe is the hybrid of Jessica Seinfeld’s spinach brownies, another low-fat brownie that I got out of newspaper almost 30 years ago, and a 3rd spinach brownie recipe that I got from I don’t know where, mixed in with a dash of my own creativity! 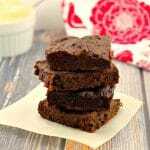 Some of the fat in these Weight Watchers friendly low-fat brownies is replaced with unsweetened applesauce. 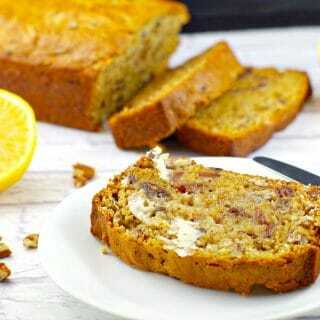 And although applesauce is a great replacement for fat (butter, oil etc) in baking, you need to be careful with it, as it can give your baked goods a chewy texture. 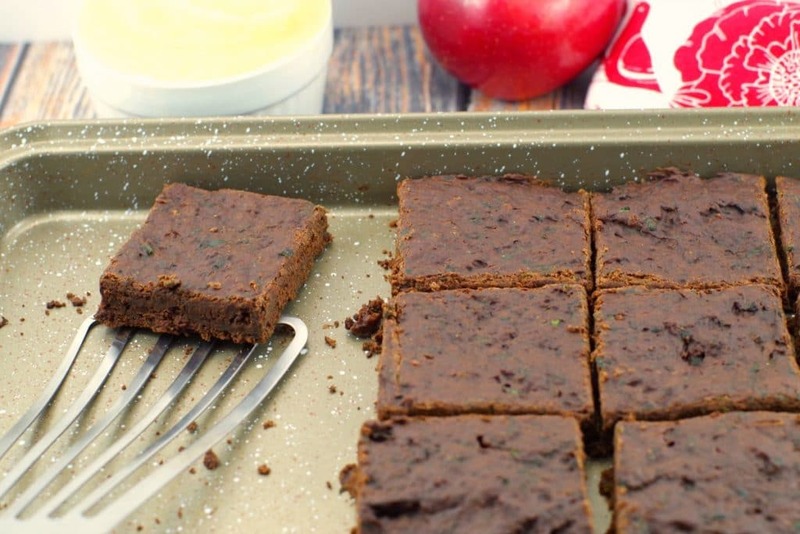 But not these guys – these Low-fat Applesauce Brownies are the perfect texture! So, if you are looking for low-fat, low-calorie healthy brownies that won’t blow all your weight watchers smart points, then give these a try. They also make a great lunchbox snack or dessert for you and the kids! Looking for other healthy chocolate recipes? 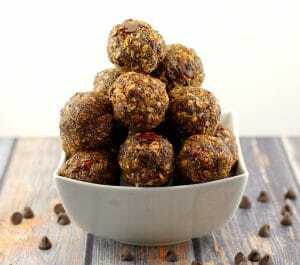 Then give these No Bake Chocolate Cherry Energy Bites Recipe a try! 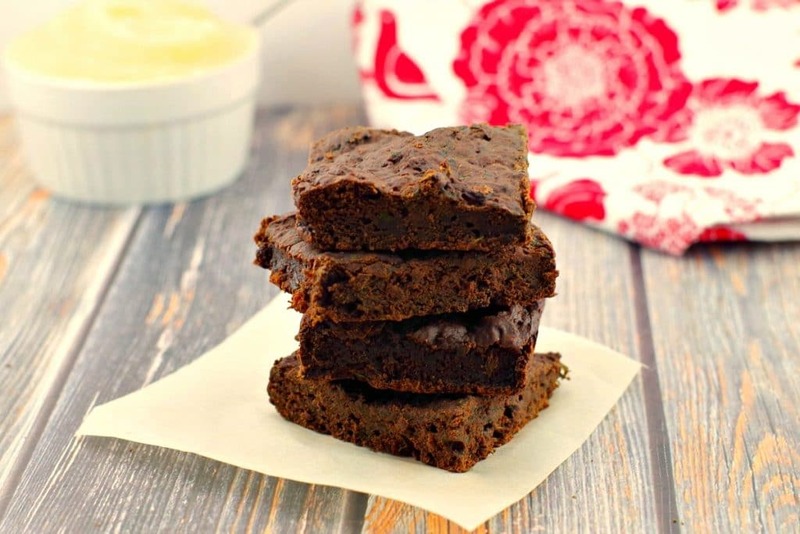 These low-fat Applesauce and Spinach brownies are healthy and weight watchers friendly, at only 4 smart points per brownie. 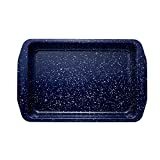 Preheat oven to 350 degrees F. Coat a 9X13 baking pan with non-stick cooking spray. Mix spinach with water and microwave for 2 minutes. Then blend in food processor until smooth. Drain off excess water. In a medium bowl stir together flour, cocoa, salt and baking powder. Set aside. Add the spinach puree, applesauce, oil and vanilla and whisk until creamy. Whisk in egg whites, then brown sugar. Then add dry ingredients to wet ingredients and mix until blended. 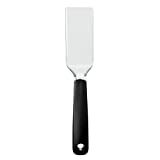 Pour the batter in a prepared pan (9X13) and bake for 35-40 minutes or until cake tester comes out clean. Cool completely. 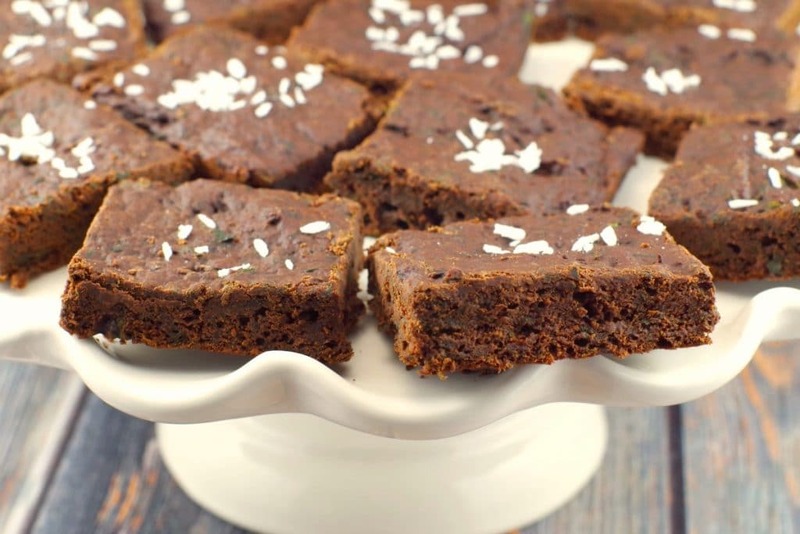 You can sprinkle a little unsweetened coconut on these brownies for a bit of contrast. Cauliflower in smoothies? I love that idea, Leanne! Thanks, Charlotte! Yes, love guilt-free chocolate! How much spinach is needed to make the puree?